Carl Zeiss obviously caught hell for its poor choice of wording on its web site concerning its upcoming announcement of ZF lenses for Nikon Cameras. The company has amended its "final solution" paragraph and eliminated the "final." Good going CZ. The solution will be revealed on 01/18/06. Until then, you will find out a little more each week from our images. As previously posted, the "final solution" paragraph undoubtedly reminded too many people of Nazi propaganda. I'm sure many people, like myself, found it offensive -- particularly coming from a German company. It's nice to see a large company like Carl Zeiss reacting quickly to fix a problem. Carl Zeiss now says it won't reveal its new ZF Nikon F mount lenses until January 18. A teaser campaign featuring web banners which will successively reveal more and more information is in full swing. The final solution will be revealed on 01/18/06. Until then, you will find out a little more each week from our images. Using the phrase "the final solution" is in poor taste, in my opinion, particularly coming from a German company. No doubt some people will find it very offensive. However, it could just be a poor English translation of their marketing push. That aside, what does the solution entail? What is the problem they are solving? The lack of Zeiss lenses for Nikon cameras has never been a problem. It would be nice to have them available, but I've gotten along fine for the past 30 years shooting Nikons without them. Apparently Carl Zeiss is not yet ready to announce its new Nikon F-mount ZF lens lineup. The announcement was scheduled for today, but now, on its web site, is a banner stating that the announcement will come December 28th. If true, this is great news for Nikon users. If Zeiss makes a ZF version of its wide angle Biogon design available for Nikon, like the awesome Biogon T* f/4.5 38mm lens on the Hasselblad SWC, Nirvana will have been achieved. So it's definitely a Nikon mount. Yeah! Rumors flying around say one of the lenses available will be an 85 f/1.4 Planar manual focus. Makes sense, considering that on the F6 at the left of the banner, the lens's filter ring says Planar. 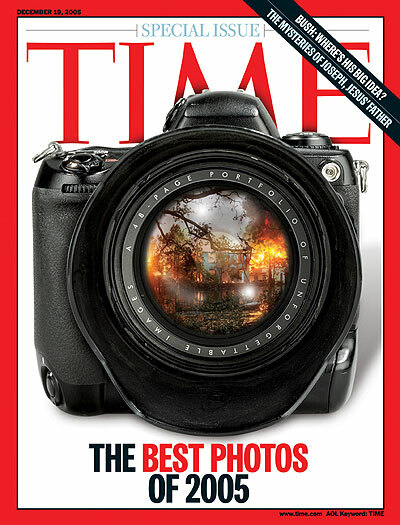 Time magazine features what sure looks like the Nikon D1 on the cover of its December 19, 2005 special issue, "The Best Photos of 2005." Inside the magazine there's some first-class photojournalism. It's definitely worth a look. It's interesting that Time chose the Nikon D1, a camera that was introduced in 1999 and is no longer in production, to represent an issue of current, cutting-edge photography. I'd be curious to find out how many of the photos in the magazine were actually shot with a D1. There are still a number of photojournalists using the six-year-old camera on a daily basis. Way to keep up with the digital photography market Time. Being a photographer and a native of Brooklyn, I'm always interested in any news relating to the two subjects. But when there's news relating to photographs of Brooklyn or photographers, I'm in heaven. However, while this bit of news relates to both my favorite subjects, it's far from pleasant and does not make me happy. In fact, it makes me mad. It seems that Brooklyn photographer Don Wiss -- who among other things has been photographing the buildings of the sleaze merchants that pretend to be Brooklyn-based photographic equipment retailers -- has received death threats because of his actions. Wiss posts the photos of these sleazemeisters' storefronts on his web site. I've been to a number of these retailers in my time in Brooklyn and actually successfully bought some stuff from them. Back then, if you dealt with them in person, they were less likely to try and rip you off than if you dealt with them on the phone. But these days, with the Internet, their scams have flowered. They constantly pull stunts like "bait-and-switch" or they sell you a camera cheap and then try and charge you exorbitant amounts for accessories that the manufacturer includes for free like lens caps and straps. ...[T]oday [December 13, 2005] I got several threatening calls. First they called my home and left a message calling me a no good mother fucker and things like that. Then on my answering machine I have my work number. So he called me there. He had a thick Jewish accent. He said he had my home address, my parents names and address and he was going to post them all over the web. He was blaming me for putting them out-of-business and that they had already shut down. While he didn't identify himself, he did say he was part of the Orthodox Jewish community in Brooklyn. He then called back about 10 minutes later. He told me to watch my back. And that if I didn't leave the country I would be killed. It seems the trouble started when an article appeared on the Slashdot web site about Thomas Hawk's attempt to buy a Canon EOS 5D camera from C&A Marketing, better known as PriceRightPhoto.com in Brooklyn. Hawk, a San Francisco-based blogger, said after the retailer tried to scam him with bait-and-switch, he was threatened with legal action and worse because he told the retailer he would write about his experience in his blog. The Slashdot article mentioned Wiss as well. It's been known for years that many of these Brooklyn retailers are scam artists. But with the rise of online shopping, their thievery has found a new outlet. But the fact that some of these sleaze merchants are now threatening people with physical harm is troubling. Where is the Better Business Bureau in all this? And where is New York State Attorney General Eliot Spitzer? His office is responsible for policing these retailers. He has the power to put these people out of business. It's obvious that no one should buy anything from these people. It's also obvious that the ones that have made death threats against Wiss and Hawk should be in jail. A.G. Spitzer, are you listening? Anyone who has ever seen a Kodachrome slide knows that they feature a wonderful, deep and contrasty color palette. They also know that after a number of years, they begin to fade into oblivion -- even when stored in a cool, dark place. If you're not familiar with the beauty that was Kodachrome, check out a photo slide show on The New York Times web site called "Poverty's Palette." It features photos from a book called "Bound for Glory," which is a collection of Farm Security Administration (FSA) photos from the late 1930s to the 1940s. What's so unusual about the book is that it features color photos. Most of you are probably familiar with the great black & white FSA work from that period. But the FSA photographers also shot in color, using Kodachrome -- which was new at the time. I found out about the slide show and the book from a short article on the Rob Galbraith Digital Photography Insights web site. Galbraith's site is one of the better digital imaging sites out there, with lots of good information, news and informative (and generally unbiased) reviews. The New York Times has posted a slideshow of very early color photographs taken from a newly published photo book called Bound For Glory. There's only one problem -- the book was published in May, 2004 and the slide show on the Times web site was posted the same month in 2004. I wonder how something like this made it onto the Galbraith web site at all. Was it sitting around for a year-and-a-half waiting to be published? I doubt it. But why didn't any notice that the story was more than a year old? One clue is the URL of the slide show on the Times web site -- it clearly says "slideshow/2004/05/07/." Mistakes like this are rare on the Galbraith web site (I wish I could say that for some other digital-oriented web sites). But this one defies all logic. Still, the slide show is worthy of a look. And the book is a good one to have in the library. Even if you came to it late (like I did), it's worth your time. But beware. If you are feeling nostalgic about Kodachrome and mourn the death of Kodachrome 25, this will only make you feel worse. UPDATE 12-15-05: I e-mailed Rob Galbraith about the article on his web site and he acknowledged that the article relates to a 2004 slide show on The Times web site. Galbraith has corrected the article to reflect this.